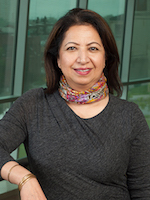 Dr. Shilpa Buch has been selected by the ISNV to present “The Women in Neuroscience Lectureship” at the 14th International Symposium on Neurovirology. This prestigious lectureship was established to emphasize and celebrate the major contributions of outstanding women in the advancement of biomedical science and, in particular, neurovirology and related disciplines. Dr. Buch received her PhD in Microbiology at M.S. University, Baroda India in 1982. She then moved to Canada for her post-doctoral training and was promoted to Assistant Professor at the Sick Children’s Hospital in Toronto, Canada. Her research at Sick Children’s Hospital focused on the pathogenesis and potential therapeutic approaches to the toxic effects of oxygen therapy in premature babies, which led to several important publications. After moving to the United States, Dr. Buch became involved in HIV and NeuroAIDS research at the Kansas University Medical Center where she spear-headed the program in SIV pathogenesis and drug abuse leading to NIH funding and many peer-reviewed publications. She is currently Professor and Executive Vice Chair of Research and Director of the Nebraska Center for Substance Abuse Research in the Department of Pharmacology and Experimental Neuroscience at the University of Nebraska Medical Center where she was the recipient of the highest scientific award at UNMC – the 2015 scientist laureate award for her outstanding research contributions to the field. Among Dr. Buch’s significant contributions to increased understanding of the molecular basis of HAND are studies to better understand the interactions of drugs of abuse and HIV infection of the CNS. In addition, recent studies in her lab uncovered novel mechanisms involved in endoplasmic reticulum stress and mitochondrial dysfunction in HIV infection of the CNS. Her landmark studies have greatly increased our appreciation for interactions among glia, neurons and components of the blood brain barrier in HAND. Dr. Buch served as the Secretary for the Society of Neuroimmune Pharmacology (SNIP), is an editorial board member of the Journal of Neurovirology, Journal of Neuroimmune Pharmacology and PLoS ONE and serves as a standing member of NIH ADDT study section and several special emphasis panels. She has published over 145 peer-reviewed articles in the area of molecular pathogenesis of HIV in many highly regarded journals including Nature Neuroscience, Blood, Nature Communications, Journal of Neuroscience, Cell Death and Differentiation, Journal of Neurovirology, Autophagy and Journal of Cell Biology. Dr. Buch has a successful record of securing both federal and local grants to support her research on HIV pathogenesis. Dr. Buch serves as the Chair of Women’s Mentoring Program at UNMC. She also completed the Executive Leadership for Academic Medicine (ELAM) program in 2016. Throughout her career, Dr. Buch has mentored students of every level, from undergraduates to junior faculty. She is an outstanding role model to young scientists everywhere.